You probably never called it “cannabis”: When you were growing up, you might have referred to it as “pot” or “weed” or “trees.” Whatever the name, the plant has become exponentially more mainstream since Colorado became the first state to pass laws allowing its recreational use in early 2014. Despite Attorney General Jeff Sessions’ mission to crush Obama-era legislation protecting states with cannabis use laws in place, in this young year alone, California’s adult use law went into effect January 1 and Vermont just became the first state to legalize through legislation. A decade ago, the more official word for “cannabis,” the one your parents may have borrowed from the media, was “marijuana.” However, amid all this legalization chatter, many industry professionals have started avoiding “the M word” altogether, part of a rebrand to detach the herb from its racist and fear-mongering—not to mention unmarketable—roots. Anti-drug campaigners of the early 20th century deployed the phrase “marijuana menace” in their propaganda to describe an imagined onslaught of cannabis-related crime, which they were sure would be perpetuated by Mexicans settling in the United States, armed with the “dangerous” plant. In magazine ads and at movie theaters, they warned the general public about the tendency for “marihuana weed” to make smokers “loco.” Short propaganda films sometimes showed a Mexican man dressed in dark colors, violent from his marijuana cigarette, terrorizing a Western ranch. Prohibitionists would declare the drug had “roots in hell,” when really its roots were just in Mexico. There are 100,000 total marijuana smokers in the U.S., and most are Negroes, Hispanics, Filipinos and entertainers. Their Satanic music, jazz and swing result from marijuana use. This marijuana causes white women to seek sexual relations with Negroes, entertainers and any others. Anslinger’s anti-cannabis, racist stance had always been out in the open; after all, he spearheaded the 1936 propaganda film Reefer Madness, which introduced African Americans as criminals, drawing more parallels with the 1800s war against opium and associated anti-Chinese sentiments. Hearst’s objections could have been based in business rather than racism or xenophobia. His main concern was that hemp could replace paper, which would no doubt negatively affect his booming publishing business. Hearst not only funneled cash towards projects like Reefer Madness, he also ran egregious stories in his papers detailing the gruesome, violent effects cannabis yielded while vilifying people of color. The racism isn’t just the word: Cannabis continues to shut black people out of its highly lucrative “green rush,” while disproportionately affecting people of color in the criminal justice system. African Americans are almost four times more likely to be charged with cannabis-related crimes; meanwhile, the glaring whiteness of mainstream cannabis culture is impossible to ignore. Last summer, Washington state’s Department of Health erected a series of controversial anti-cannabis billboards aimed towards Hispanic youth, proclaiming, “We don’t need pot to have fun. 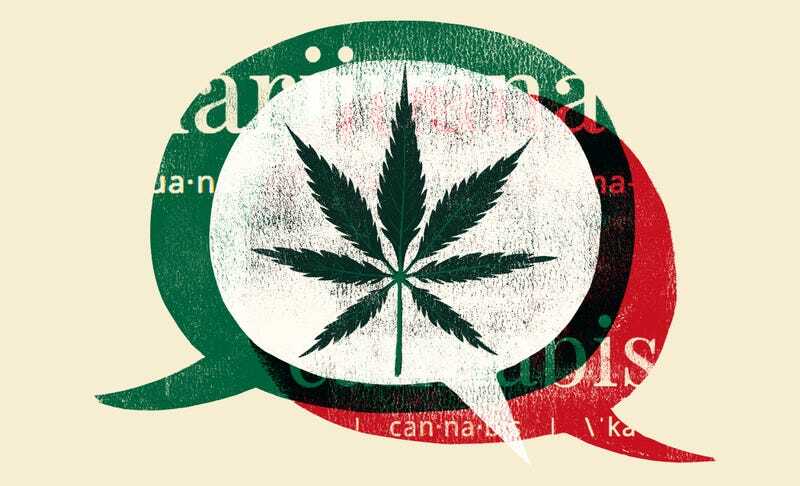 We’re Hispanics… we’re cool by default.” It’s troubling to target the Latinx community as more likely to consume cannabis than other races; plus, it seems counterintuitive to insinuate a substance you’re rallying against is cool. Although decriminalization efforts have been a promising step towards progress, prisons remain flooded by people incarcerated on non-violent charges related to cannabis, many of them people of color. And whether or not cannabis advocates actually care about the prison industrial complex, they know the racist terms like “marijuana” are bad for business. Enter the verbal makeover. And the rebranded glossary goes far beyond “cannabis.” Many collectives no longer refer to people as “customers” but rather “guests” or “patients,” because “providing excellent customer service is the cornerstone of our business, and we want everyone to feel welcome,” says Elise McDonough, employee of Santa Cruz dispensary KindPeoples (and author of The Official High Times Cannabis Cookbook). Conscientious word choice is key in making room for cannabis to boom, but more importantly, it brings a tiny bit of racial consciousness to an industry that for decades has shut out people of color. These folks with business stakes in cannabis abandoning “the M word” could be working towards finally restoring integrity in a historically racist industry—or it could just be a happy by-product in a massive rebranding for the herb. Only time, and legislation, will tell. Beca is an Atlanta-based culture writer and editor.